The Dark Ranger: "I Am A (Dark) Ranger!!!" "I Am A (Dark) Ranger!!!" Un-hockey-related, The Dark Ranger has received a facelift and a new menacing avatar. Many thanks to Jay for continually visiting the site, believing in the Rangers when they are up & down, and most importantly, for offering the new look unsolicited. Now that is readership loyalty. I like it. Tell us what you think of the NEW Dark! ALL THE BAD ASSES MIXED INTO ONE. That should win the season for us. 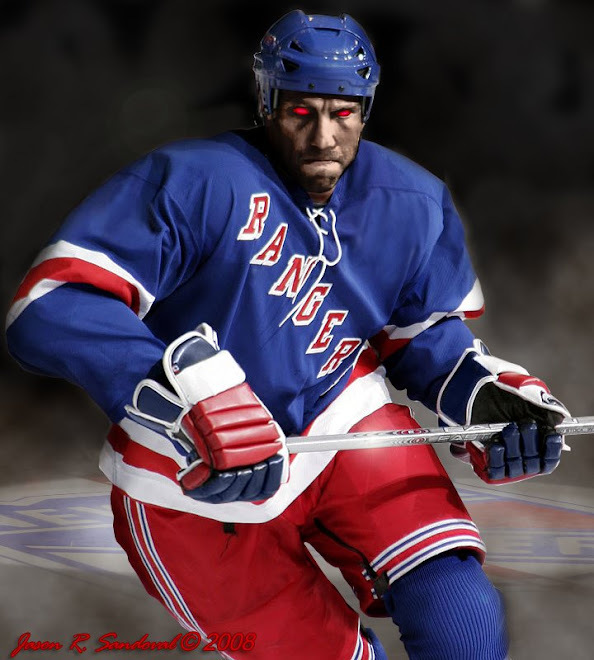 Kind of reminds me of a cross between a Rangers version of Foppa meets Stephen King! Looks good Dark - sorry no freebies from me. Looks a little like Marek Malík. Just kidding Oh Dark One. EXCLUSIVE to The Dark Ranger!!! !